After a recent upgrade to UCS Director 5.4 I noticed that my storage connections were showing a status of failed on the dashboard. I went to Administration -> Physical Accounts -> Physical Accounts. 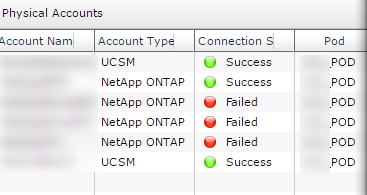 All of my NetApp controllers were offline. I went to edit settings and re-entered my password to make sure that it had been picked up correctly. All the settings were fine so I saved them and tested the connection to the controllers again. Server chose SSLv3, but that protocol version is not enabled or not supported by the client.